All of you cat lovers out there aren’t going to be very happy with my use of the word “torture” to describe what your beloved pets do to little animals like mice, frogs, birds, and geckos. It’s hard to think badly about your beautiful, soft, cuddly friend and easy to rationalize any behavior no matter how abhorrent. The justification usually comes out something like: “Oh! That’s just what cats do. She’s only playing with the mouse.” Humm, I see,” only playing”. I wonder what the mouse would have to say about that euphemism. Diane and I live in a rural environment, and our three cats roam about freely inside and outside. They all love to hunt, seldom eat what they kill, and often don’t kill what they catch. I have watched a cat grab a battered mouse in its mouth, toss it into the air, bat it around with its paws, scratch it, and, when the prey quits moving, leave it to die a slow and painful death. You can call that whatever you want, but I call it torture. I love our pets, but I love nature even more. Though I never really thought about it, it never occurred to me that this type of behavior might exist in the wild. Somehow wild animals, even cats, seemed too noble to engage in anything as abominable as torture. Mark Wainwright, in his excellent field guide, Mammals of Costa Rica, describes how the specialized dentition and formation of the jaw of our wild cats is adapted to killing their prey quickly and efficiently. He tells us: “They kill with a bone-splintering bite to their prey’s head or neck, for which the canine teeth – the broadest and strongest of any carnivore – are essential. … A gap between the canines and the cheek teeth allows the canines to sink deep into the prey.” Not only Wainwright, but many other sources refer to the death bite inflicted by the large felines. I’m sure that I have heard about it on Animal Planet more than once. Cats are almost exclusively carnivorous seldom touching any food other than animal flesh. Wainwright goes on to say that pumas and jaguars eat deer, peccary, pacas, armadillos, rabbits, agoutis, opossums, porcupines, spiny rats, iguanas, bats, and snakes. Other sources also include coatis and raccoons in the list. At Hacienda Barú National Wildlife Refuge we have six trail cameras which are located in places frequented by wildlife of all kinds. 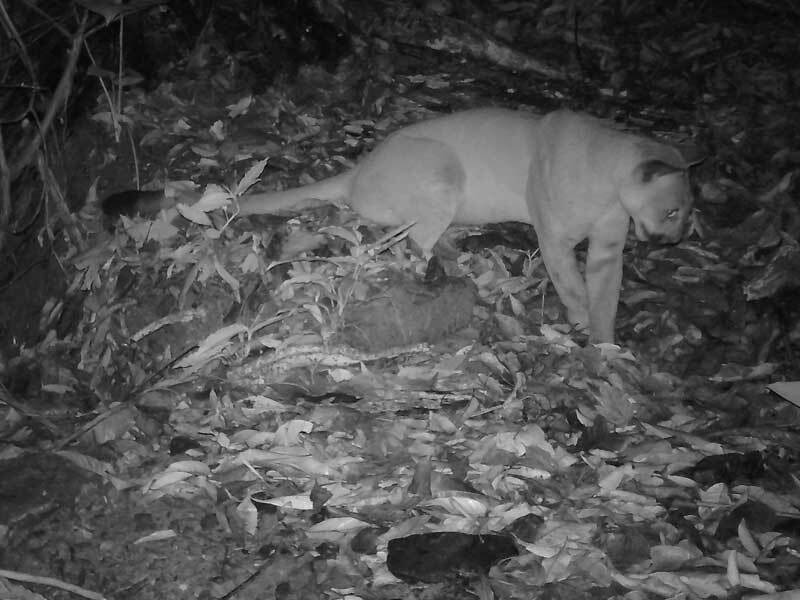 Seldom does a month pass when we don’t record at least one puma, the largest carnivore found on the refuge. 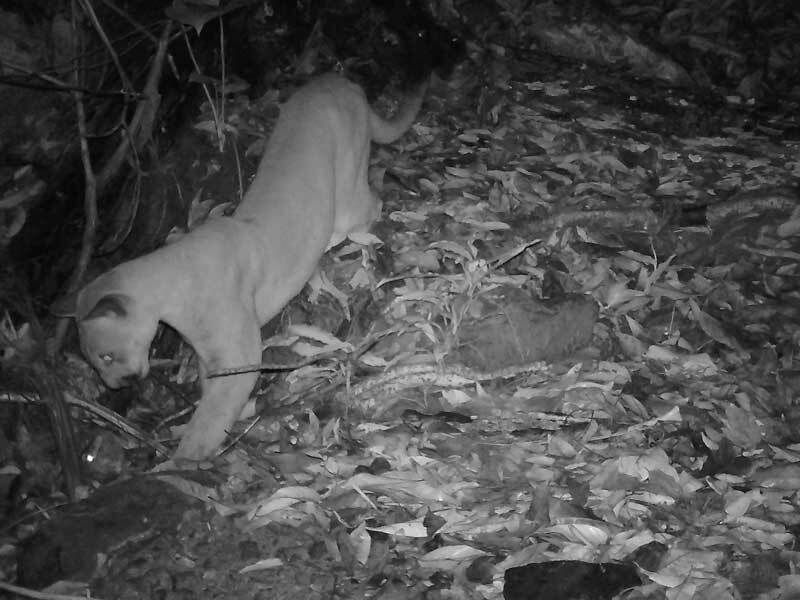 Usually the photo or video just shows them walking past the camera, but on April 19, 2017 one of the cameras captured a series of 108 photos of a female puma and her prey, over a period of 32 minutes. The prey is definitely an opossum, but the species is unclear as the coloration appears to differ in different images. 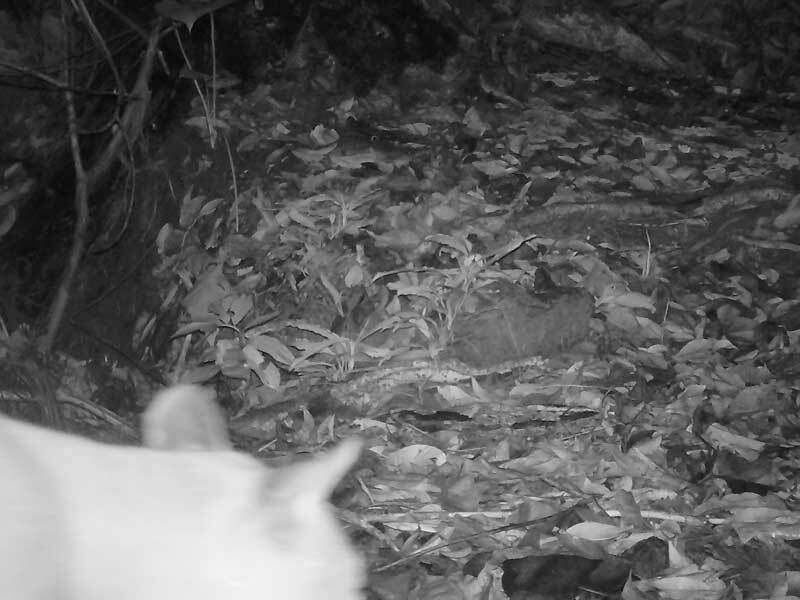 After studying several photos and consulting with our guides I think it is probably a water opossum. The location is right next to a stream, a likely place for that species to be found. 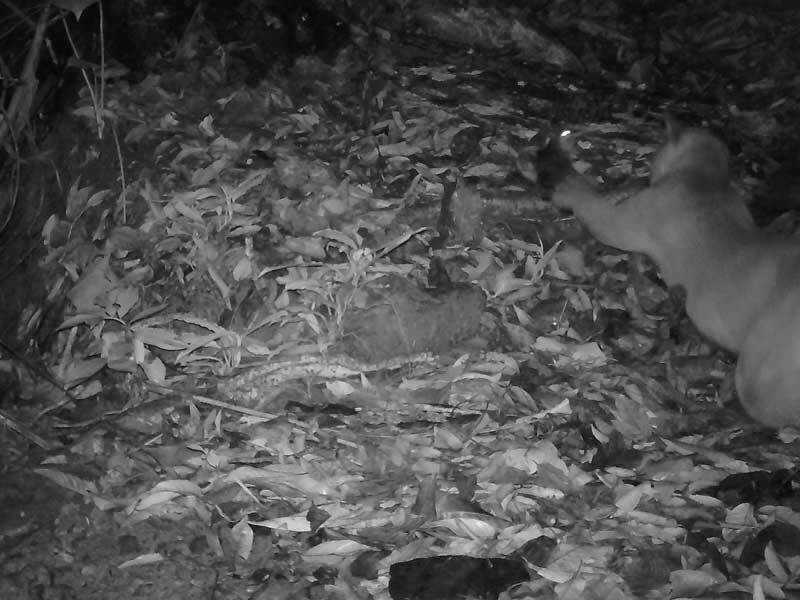 In the images it appears like the immediate area was lit up, but the lighting is infrared and not visible to the puma or the opossum. Infrared rays emitted by any warm blooded animal will activate the camera. This camera was set to take a series of three photos, pause for 5 seconds, activate again, and take three more. I want to share some of those photos with you. They completely shattered my idealistic conception of the nobility of wild cats. 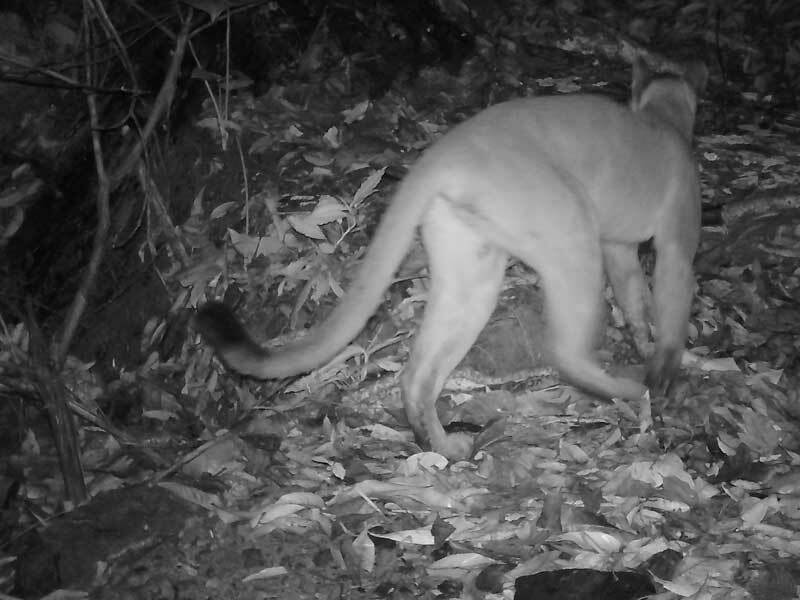 At 03:09:34 am an adult female puma arrives at the location and activates the camera. The date and time are visible at the lower right of the image. At 03:11:20 her head appears in the lower left corner of the photo. She seems to be looking at something on the ground. Thirty-seven seconds later at 03:11:57 we catch our first glimpse of the opossum who appears to have already suffered enough physical abuse so that it is unable to escape. In the image it appears dead, but in the series of three photos it is obvious that it can still walk. I only include one of the three here because of space limitations. 03:13:45 She is staring at the opossum on the ground. It is hidden behind her head. 03:14:46 They have moved back toward the stream. 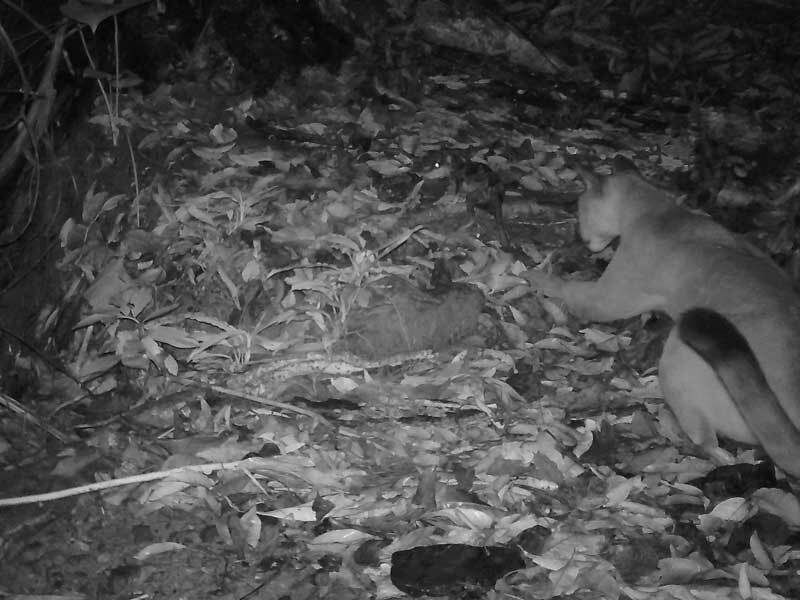 03:16:12 The puma and the opossum have moved several meters up the slope, and she is batting it around with her paw. 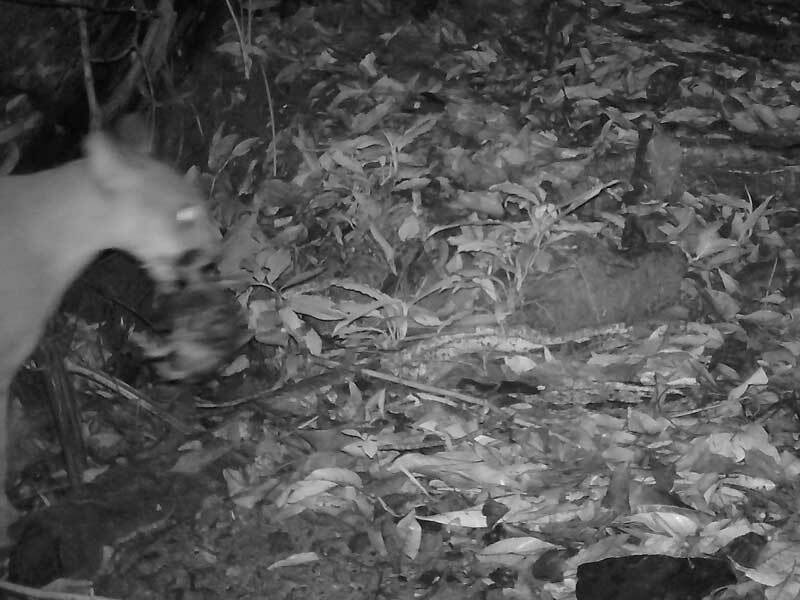 03:22:39 They are back down near the stream again, and she has the prey in her mouth. 03:22:54 She has carried it back up the slope and is batting it around again. 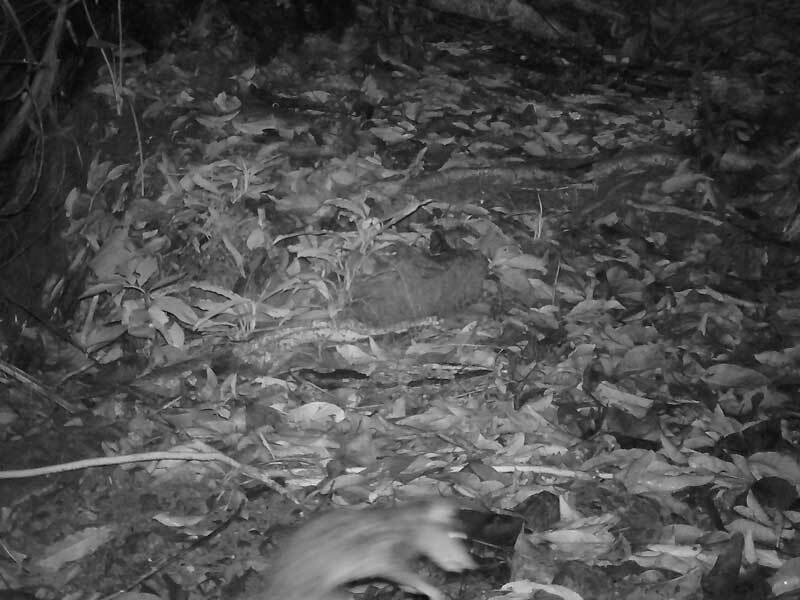 The opossum is difficult to see in this image. 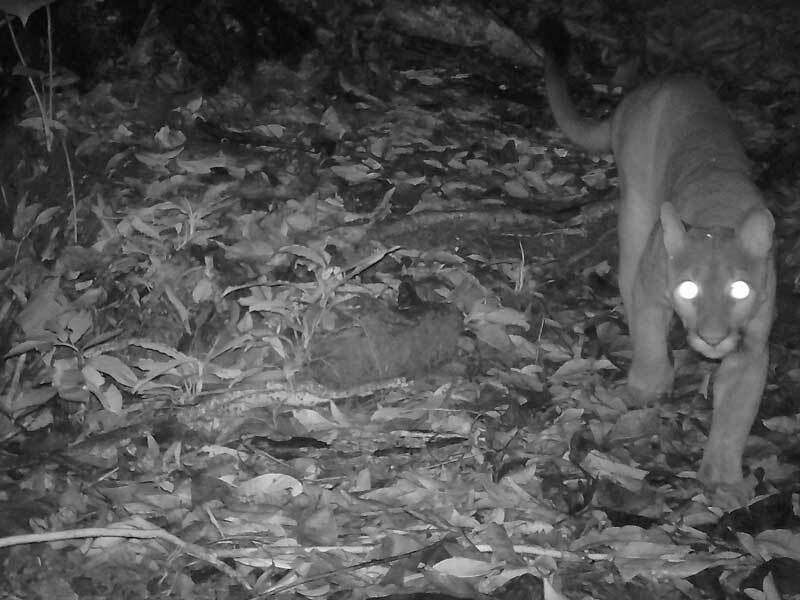 Its bright eye is visible to the right and slightly above the puma’s paw. 03:23:06 Only 12 seconds later and they are back down by the stream. Again, only the eye of the prey is visible. 03:39:50 Almost 17 minutes later the opossum is still alive and moving. The movement is only visible when scrolling through the series of three photos. 03:41:09 Leaving the scene 32 minutes after arriving. 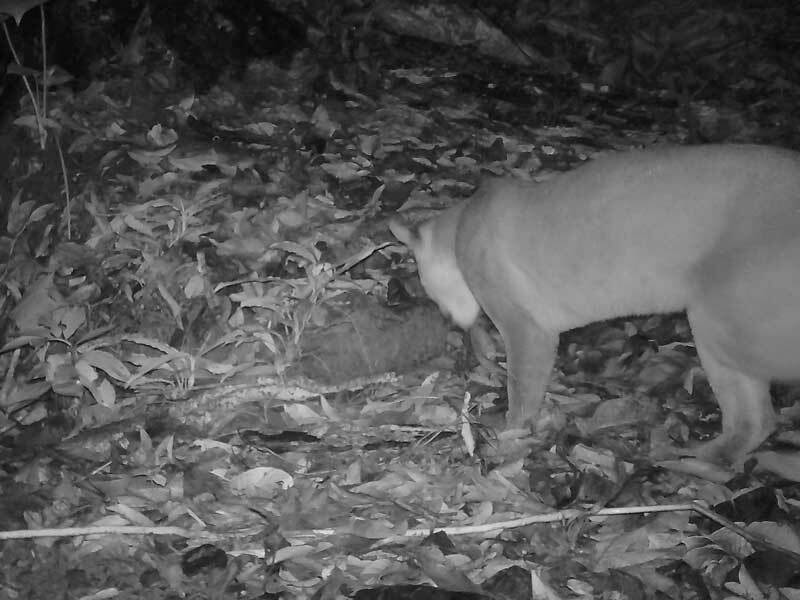 In pondering over this situation and looking for an explanation that is consistent with Wainwright’s description of the “bone splintering bite to the head or neck” I believe that this puma would have acted much differently if the prey had been larger and able to fight back. 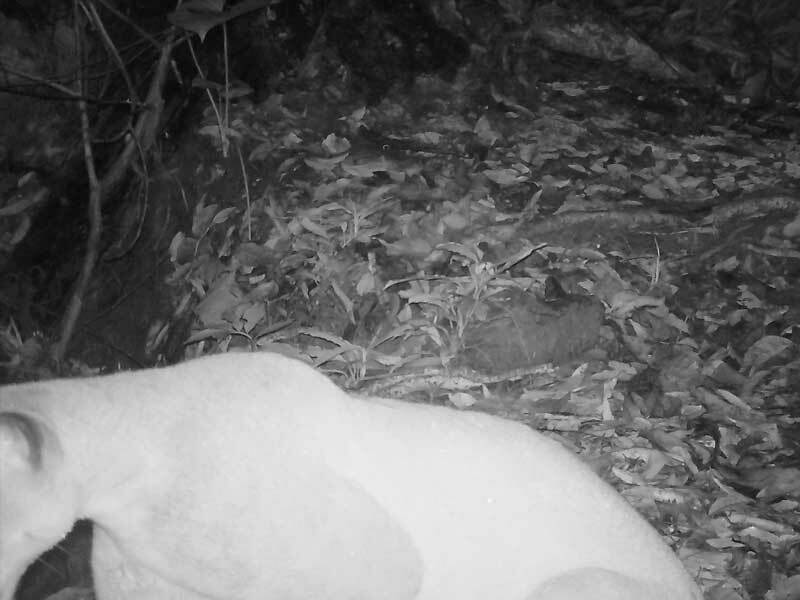 The tusks of a peccary or the antlers of a deer could definitely do some damage, and the puma would probably go for the fastest kill possible. Even the claws or teeth of a coati, raccoon, or paca would give a puma second thoughts. But this opossum was totally defenseless allowing the large cat a chance to “play” with its prey. Mother Nature often acts in strange ways, and the more I delve into her mysteries the more I realize how little I really know of her secrets.